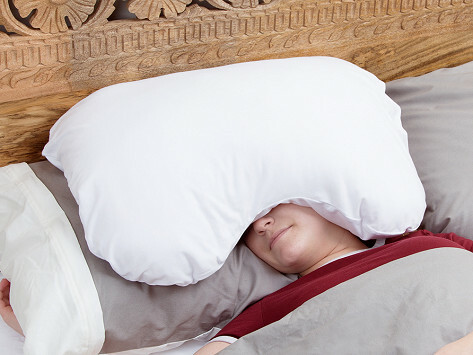 This hypoallergenic over-the-head pillow was designed to provide gentle pressure that can stimulate deeper relaxation—and lead to better sleep. It is seriously soft and hand-stuffed in Texas with plush faux down filling that is then wrapped in three layers of bamboo fabric. Tuck the curved design over your eyes and ears to help block out light and muffle sounds. I love this pillow SO much! Even though I paid more than the current price, I ordered a second one after I started using the first. Years ago/> Years ago I used a second pillow to cover my head, but stopped because it was too much of a hassle wrestling with two pillows at night. I have health issues that make sleep difficult, and our room has electronic devices that have little lights on them that bother me a lot. I know those lights are bad for healthy sleep. I also frequently need to sleep during the day, and this pillow is wonderful for helping me to get to sleep, and stay asleep comfortably. The pillow can be hot on my head, but I still like keeping it near to help keep my head in a comfortable position. Someone was reading my mind! I had no idea something like this existed. So great the whole family wants them! We couldn’t keep our hands off this silky-soft pillow, and think over-the-head sleepers will appreciate the deeply relaxing sensation it provides.